Behavioral modules are units of behavior providing reusable building blocks that can be composed sequentially and hierarchically to generate extensive ranges of behavior. Hierarchies of behavioral modules facilitate learning complex skills and planning at multiple levels of abstraction and enable agents to incrementally improve their competence for facing new challenges that arise over extended periods of time. This chapter focuses on two features of behavioral hierarchy that appear to be less well recognized: its influence on exploratory behavior and the opportunity it affords to reduce the representational challenges of planning and learning in large, complex domains. 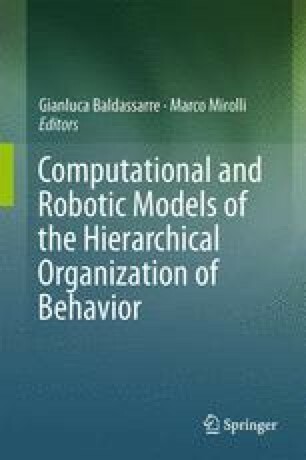 Four computational examples are described that use methods of hierarchical reinforcement learning to illustrate the influence of behavioral hierarchy on exploration and representation. Beyond illustrating these features, the examples provide support for the central role of behavioral hierarchy in development and learning for both artificial and natural agents. The authors thank Sridhar Mahadevan, Rod Grupen, and current and former members of the Autonomous Learning Laboratory who have participated in discussing behavioral hierarchy: Bruno Castro da Silva, Will Dabney, Anders Jonsson, Scott Kuindersma, Scott Niekum, Özgür Şimşek, Andrew Stout, Phil Thomas, and Pippin Wolfe. This research has benefitted from Barto’s association with the European Community 7th Framework Programme (FP7/2007–2013), “Challenge 2—Cognitive Systems, Interaction, Robotics”, grant agreement No. ICT-IP-231722, project “IM-CLeVeR—Intrinsically Motivated Cumulative Learning Versatile Robots.” Some of the research described here was supported by the National Science Foundation under Grant No. IIS-0733581 and by the Air Force Office of Scientific Research under grant FA9550-08-1-0418. Any opinions, findings, conclusions, or recommendations expressed here are those of the authors and do not necessarily reflect the views of the sponsors.